This dress . This light. Sometimes you just have to twirl. Redwood Hill Gardens is tucked away just past Sebastapol California. Blair and Jason's day lovely garden party was complete with romantic blooms and guests that knew how to have fun. The ceremony was nestled under the redwoods, the most delicious dinner was served until dusk and the night complete with poolside dancing. Many thanks to Zach for being my right hand man! Ivy and Robert were traveling through and wanted to document just the two of them and their growing baby bump. We wandered a bit down by the ocean. So much pretty from Blair and Jason's Garden wedding at Redwood Hill Gardens this weekend! Full post coming up soon! One lovely frame of Stacy and GP's beautiful wedding overlooking the ocean. The sunset was incredible. Fog makes everything better. 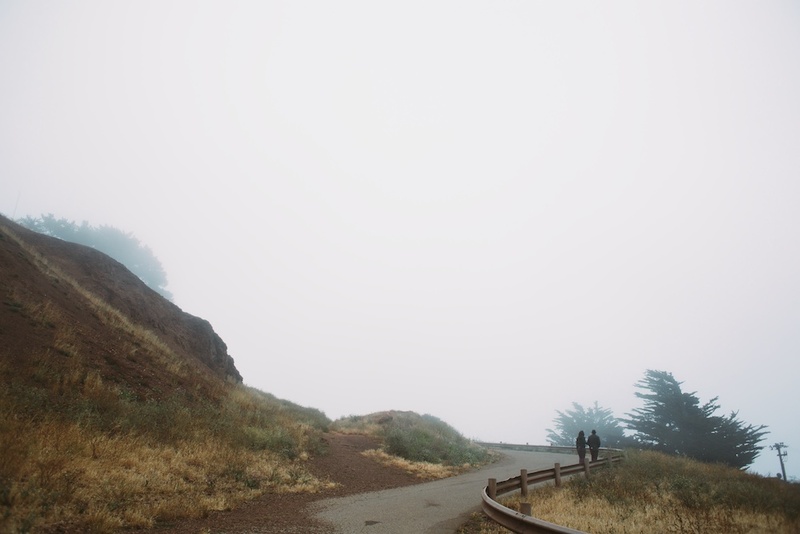 For Part 2 of Blair and Jason's engagement session we went to the top of Bernal Hill in San Francisco. We were originally thinking lovely panoramic views of the city but instead we got this delicious heavy fog. And really, I couldn't have asked for more. Click here if you want to go back and see Part 1 of their session in The Mission!